Kettler Software World Tours 2.0: Get the world at home ! Manhattan or Paris - exercise stages of the whole world with the Kettler Software World Tours 2.0 in your fitness room. Just connect your compatible Kettler fitness machine to your computer with the installed Kettler Software World Tours 2.0 and start exercising. In cooperation with Microsoft Bing Maps, the Kettler Software World Tours 2.0 simulates outdoor tours close to reality, you work with 3D aerial views. The topographic data and height profiles are transmitted to the Kettler fitness machine - Kettler Software World Tours 2.0 controls the intensity appropriately. Ascents of the tour are paralleled by increased resistance. Import own GPS data with the Kettler Software World Tours 2.0 and cycle/run own favourite tours at home even when the weather is bad. Do exciting competitions against friends all over the world in the race mode. 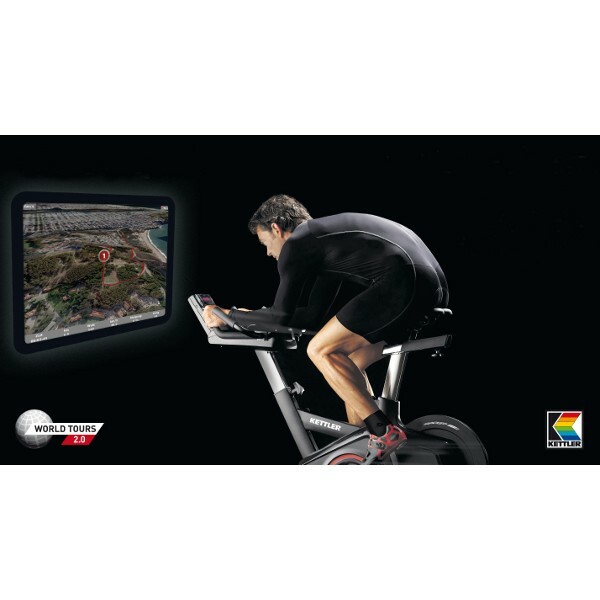 The Kettler Software World Tours 2.0 offers several possibilities for detailed analysis of your workout as well. Lieferung ist bestens gelaufen. Das Ergometer kann ich nur empfehlen. Echt spitze! Benutze die Software im Zusammenspiel mit einem Kettler Laufband. Dadurch werden die Trainingsmöglichkeiten vervielfacht. Einzig die Funktion "GPX-Track mit Höhenprofil nach Zielpuls ablaufen", wie es bei Fahrradergometern möglich ist, fehlt noch. Das Training kann man durch diese Software sehr individuell gestalten. Super Ergänzung zum Trainieren. Macht viel Spaß und motiviert. Macht aus meinem alten Ergometer ein ganz neues Trainingsgerät. Was vorher eintönig war ist nun vielseitig. Man kann quasi die ganze Welt abfahren, Rennen gegen andere Mitglieder fahren oder einfach nur Intervall-Trainingsprogramme erstellen und fahren. Das perfekte Training für das schlechte Wetter im Winter.